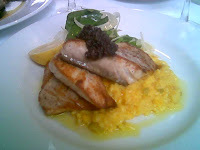 Main: Kingfish on Saffron Risotto with Spinach and Fennel Salad & Tapenade - beautiful. The salad was lovely - I think this is the first time I've actually eaten Fennel! My goodness! Dessert (shared): Panacotta, Roast Peaches, Praline - wow - the panacotta was so rich and milky and smooth and delicious! The Praline was fabulous - not too cruncy, but not soft, and deliciously nutty. 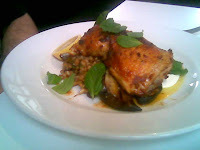 Main: Harissa Roast Chicken with Pearl Barley, Aubergine and Tahini - this was beyond words delicious and I sooo want the recipe for the pearl barley. 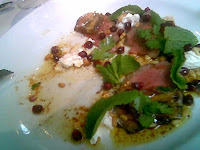 Everything was in wonderful balance, bursting with flavour and nothing too overpowering. I'd order this if I went back. My fish was good, but this was truely rave-worthy. Jane - Craggy Range Kidnappers Chardonnay 2006 - once again, I didn't really profile this, but wasn't raving over it. Although I wouldn't complain if I was served it again. Lovely as always, very simple and clean. The smell of fresh mint hit me as soon as I walked in and it was divine. The music was really nice, quite contemplative adn atmospheric, most appropriate, and a good volume. Excellent. As always, very professional, helpful, not stuffy. It wasn't what I would call 'stand-out' service, but excellent all the same - if you know what I mean by that subtle distinction. (I still tipped them - so it was better than average!). Oh yes - and it was encouraging hearing the staff describing dishes and wines with knowledge and confidence. Mains up to $30, starters $16-$18. Simon thought the starters a little pricey, but I expect to pay this in a classy restaurant. No complaints though.